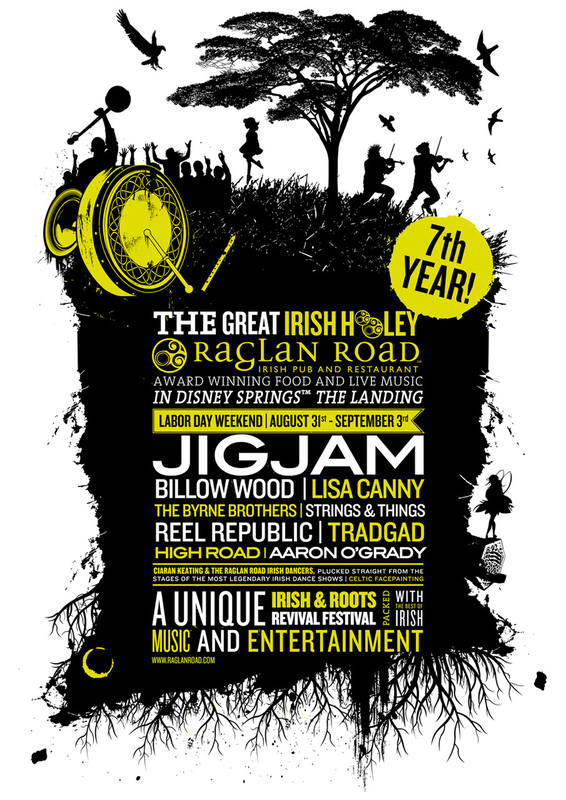 The Great Irish Hooley Returns to Raglan Road for Labor Day Weekend! 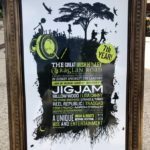 The Seventh Annual ‘Great Irish Hooley’ Music Festival returns to Raglan Road in Disney Springs for Labor Day Weekend! If you’re wondering what a “Hooley” is, then wonder no more! It’s a traditional Irish social celebration combining music ranging from traditional to rock tunes with entertainment and fun for the whole family (no cover charge). Mark your calendars for August 31-September 3 and start preparing for this high-voltage Irish music festival serving up a colorful live playlist of traditional Irish, Celt grass, folk, blues and soul into the wee hours each night. Plus, the Raglan Road ‘Great Irish Hooley’ will feature Celtic face-painting and the opportunity to learn some traditional Irish dance steps throughout the festival– no experience necessary! You’ll find entertainment inside and outside the Pub. The Grand Room stage inside the Pub will feature crisp acoustics and stunning video choreography. Bands also will play outside on the pub’s patio stage, where you can enjoy dinner, drinks and toe-tapping entertainment. 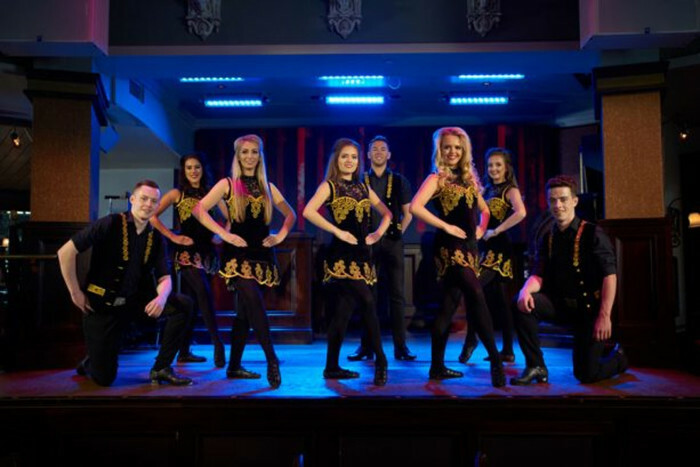 The Raglan Road Irish Dancers, of course, will perform throughout the ‘Great Irish Hooley’. Plus champion Irish dancer Ciaran Keating, Raglan Road’s show choreographer, will host an entertaining workshop that traces the origins of Irish dance from earliest jigs and reels through contemporary times. Strings & Things — Strings & Things are an original Irish folk/trad crossover four-piece band from Tipperary/Galway. Over the years together they have created their own original sound and produced a variety of crossover songs by putting their own stamp on them. The Byrne Brothers — An exceptionally talented traditional Irish music family from Donegal. They are Luca, 13 (button accordion); Finn, 11 (banjo, mandolin and whistle); Dempsey, 8, (whistle and bodhran); and father, Tommy (guitar, Uilleann pipes, fiddle, whistles, bagpipes and bodhran). Their show combines traditional Irish tunes with modern dance beats, and they love to interact with every audience. 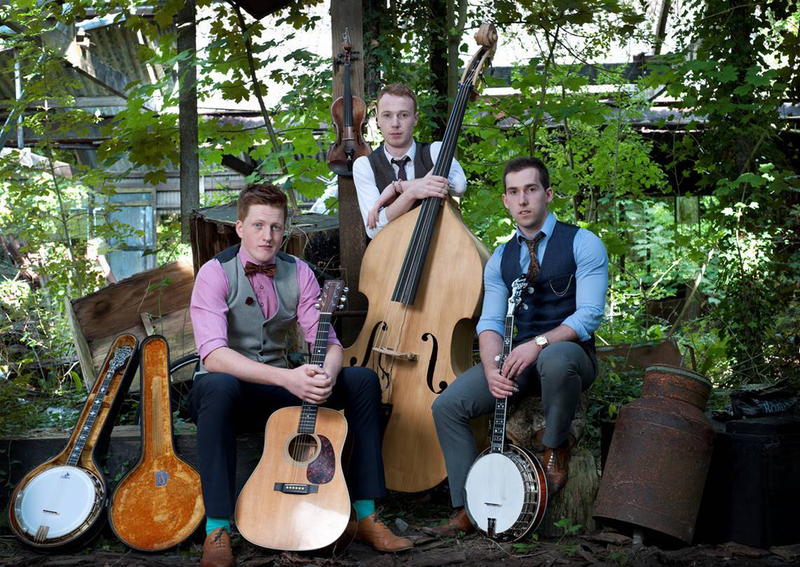 Reel Republic –- Hailing from the southwest corner of Ireland, Reel Republic are four seriously talented musicians revving up audiences with a solid spectrum of Irish tunes and songs. TradGad – Three talented lads from Kerry, Dublin and Edinburgh charm Raglan Road audiences singing and playing guitar, fiddle, mandolin, uileann pipes, tin whistle, banjo and bazouki. High Road – Three talented musicians hailing from Dublin, Kilkenny and Glasgow meet in the middle to play a crowd-pleasing symphony of traditional Irish tunes and songs. Aaron O’Grady – An Irish import who will entice and beguile with his eclectic mix of Irish music. The Raglan Road Irish Dancers — Plucked from the cast and stages of the world’s greatest Irish dance shows, the Raglan Road Irish Dancers perform throughout the Great Irish Hooley. Remember, this is a family-friendly event; kids of all ages are welcome to join in the fun. 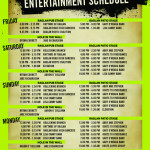 The complete entertainment schedule will be posted at www.raglanroad.com closer to the event. Join the DFB Newsletter to get all the breaking news right in your inbox! Click here to Subscribe! The 2018 DFB Guide to Walt Disney World Dining, is now available! 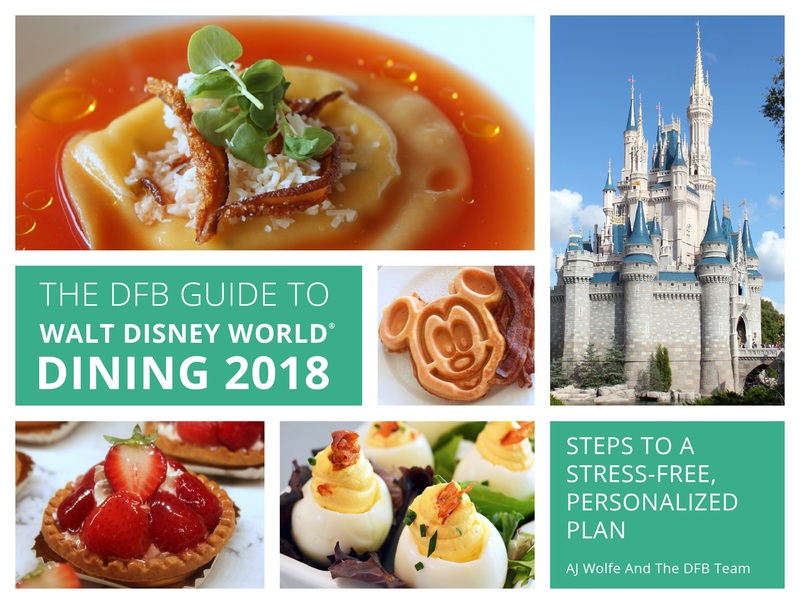 With more than 650 pages, the 2018 DFB Guide to Walt Disney World Dining is full of tips and planning tools developed by Disney World experts over 20+ years of visits. We’ve done the research for you, so you’ll know just which spots will uniquely suit your family’s needs! With mini-reviews of every single restaurant, bar, lounge, kiosk and more; an entire chapter on the best snacks in Disney World; full Disney Dining Plan analysis (and how to get FREE dining); and a full chapter on discounts and deals; you’ll have everything you need to plan your best vacation yet. Click here to order your copy of the 2018 DFB Guide to Walt Disney World Dining E-book with code WDW2018 to save 25% today! 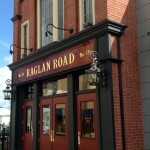 Would you like to attend the Great Irish Hooley at Raglan Road? Please let us know with a comment! 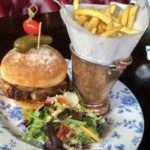 Review: New Menu Items And Two NEW Craft Cocktails from Raglan Road at Disney Springs! 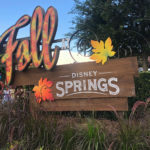 What’s NEW At Disney Springs? A WHOLE LOT! Check it out…. « Dole Whip Eclair Debuts In Disney Springs! What We’re Going to Eat (and Drink!) FIRST in Disney’s Star Wars: Galaxy’s Edge! DFB Sarah on FULL REVIEW! NEW Taste of Magic Kingdom Park VIP Food Tour! So… What Did We Think? DFB Sarah on BREAKING NEWS: One of Magic Kingdom’s Character Cones has Flown the Coop! DFB Sarah on What’s New in Epcot: More Construction Updates, New Merch, and AWESOME GUMMY CANDIES!